The bathroom is supposed to be one of the best and most relaxing rooms in the home, but sadly, not many of us can boast of such. Most bathrooms are simply utilitarian spaces where we do our business and then get out. It doesn’t have to be this way, however. If you’re tired of having a dull and boring, lifeless bathroom, then this one’s for you: do you want to give your bathroom a makeover? Here are some simple and easy ways how. You probably have a basic medicine cabinet or cupboard in your bathroom. If you do, it’s time to replace it with some nice mirrors with a great, unique design. Why not put up a big mirror with a vintage look, or a more modern, contemporary mirror with a geometric style? A new mirror can instantly perk up the look of your bathroom and make it a more pleasant, brighter place in your home. If you’re tired of having a staid, boring bathroom, you can also paint it. Mind you, you don’t have to go through the effort of painting all the walls – even just painting one wall can already make a big difference. Just make sure the colour you choose is bold, bright, and striking, such as a deep red, a bright, apple green, or a calming sea blue. Most bathrooms have a single light bulb suspended from the ceiling. But you’d be amazed at how different your bathroom will look if you change the lighting. Instead of a boring old light bulb, you can opt for a more striking, brighter light fixture that can really make your bathroom look magnificent. You can also choose to install lights such as spotlights at the corners, or accent lighting to instantly transform your bathroom’s atmosphere. If you are willing to spend a bit more, you can even change the bathroom’s existing worktop. The worktop needn’t be too expensive, either – there are some affordable choices when it comes to worktop materials as well. Changing your bathroom’s worktop will not only make your bathroom look fresher and more luxurious – it can also make your bathroom much more efficient. One major element in any bathroom is the shower. 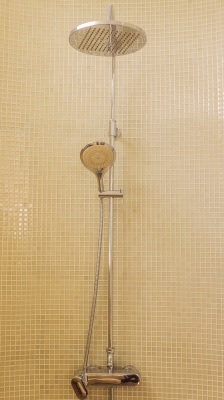 Your old shower may actually be a main detriment to your bathroom’s overall look. Replace the old shower with a new shower cubicle (pre-fab models are more affordable than ever) and you can benefit from a better-looking bathroom as well as some fantastic shower features, such as water jets, great lighting, rain showerheads, and more. Adding a pool: should you do it?